Hello! Novembrrr is here and it’s been a chilly one. The boat has been sold, so it’s been ducks and deer up until here. Soon things will change and the SnoBear will be back in action. In fact, there were ice fishers out on North Long 371 Bay today (November 18th). That’s a pretty darn early start to the ice season. The big lakes are still white capping and by the looks of the forecast, we might be waiting for awhile yet for them to be covered with ice. We have been getting calls for ice fishing trips and we’re currently booking trips for the 2017-18 season. Most of our guided trips will be near our home in the Brainerd Lakes Area, but we will certainly venture out if there is a calling. Mille Lacs will be fun to fish this winter, and it will be nice to have a chance to bring home a fish too. The SnoBear is a versatile ice fishing machine and we can tailor the trips to your liking. 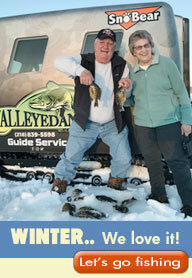 If you would like to book an ice fishing adventure today, call 218-839-5598. Happy Thanksgiving!, Walleyedan – p.s. Go Warrior and Patriot football teams! Hello from up in the sky! My son and I are in flight to Idaho in search of elk. Actually it’s way more than just elk. It’s father son bonding and also some brother bonding, as we are meeting up with my brother John (who lives out here). As an outdoorsman, the mountains are a special place and we are looking forward to what is to come! This hunt is an archery hunt and we are legal to shoot either a bull or cow elk. The weather looks good and our timing should be good to hear a bugling bull or two. If you’re out hunting, I wish you well. Fishing… Well, I will admit that I personally have not been knocking the snot out of them. In fact, I can’t remember my last good trip! It will change and I’m going to give it 10 more days before things get good and consistent again. This will be in perfect time for the 5th annual Walleyedan’s Fishing To End Hunger walleye tournament on the Gull Lake Chain. The tournament is based out of Bar Harbor Supper Club on October 7th and as of right now we are getting close to filling up the field of fishers! Gull has really caught fire around tournament time the last couple of years and it’s looking like it may happen again this way this year. Big chubs, Jigging Rapala’s, night crawlers, jig and minnows, cranks and about every other conceivable walleye presentation will be used to try and coax some walleye into the boat. The whole chain of lakes is fair game and each team is allowed to bring 5 fish to the scale (with only one of them being 20 inches or longer). You still have time to sign up for this charitable event and we would love to have you come join us in raising money to feed people in need of nutritious meals here at home and around the world. For more info, go to www.fishingtoendhunger.com. Good morning! I hope the sun is shining where you are at, it’s been awhile since we have seen it here in the Brainerd Lakes Area. But, it sounds like it is supposed to sow itself tomorrow and I’m hoping that happens. I have been on the water a fair amount and have also spent some time in the woods chasing turkeys at the 11th hour. Fishing is good and should get even better in the next two weeks. I have spent the majority my time on Gull Lake and we have put some nice fish in the boat. The big ones have made a comeback and we are just hoping that the young bucks are somewhere to be had. Yesterday I was out with 4 men and we worked it pretty hard. For those that don’t have patience, this would not have been a trip for you. We caught 6 fish, all over 20 inches. Including a 24, 25 3/4, 26 and 27.5, nice walleyes anywhere, but really nice to see coming out of Gull. We caught them in 15-25 feet. The new Larson FX 2020T is decked to the hilt with my Hummingbird electronics and MinnKota trolling motors, this boat is SOLID and a truly awesome guiding machine! 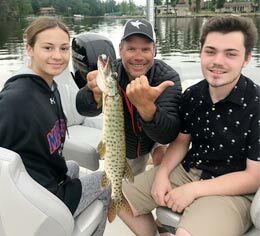 The summer is looking to be a busy one, so if you are interested in coming up to the Brainerd/Mille Lacs area, please give us a call at 218-839-5598 and book your trip or trips. Whether it is smallmouth or walleye on Mille Lacs or any species here in the Brainerd area, we will have a guide that can put you on them! Whether or not they bite, that’s going to be up to your talent level! But we will offer you up advice, and try to give you the best opportunity to catch some! Bottom line, for you, it’s better than working so book today. p.s. The 3rd annual Lil’ Fry Fishing Tournament will be held off the docks at Bar Harbor on Saturday from noon until 2! Lil’ Fry, big checks!! We have drawn the participants for this year, so you will have to wait and get your name in the drawing for next year! See you there. Happy Labear Day! Got my first black bear last night, and we got it on film. Pretty cool sport and quite an exciting night in the tree. I though I was going to have to push the bear back down the tree with my arm, or crack out the 870 that was resting behind me loaded with some Federal slugs. But instead, I went to full draw with my Gearhead compound bow and I put the arrow right through the liver and then some! It ran off about 40 yards an expired. We are going to start filming weekly and will be uploading our stuff to YouTube. If you have a creative title for us, please email me. So, the first hunt of the season is in the books and it sure got me in the mood. By the way, I made about a 4 yard shot and the arrow is now washed off and ready for our trip to hunt elk with brother John later this month. p.s. We actually need to vote for Trump whether you like him or not! Craziness!! It’s go time and I’m getting the list whittled down little by little! So much has happened dueling these last couple of months it’s unreal. But, the bottom line is the fact that the Minnesota Fishing Opener is at midnight tomorrow. We have a very busy weekend as a guide service and then mix in the Lil’ Fry Fishing Contest at Bar Harbor, Mac and Elizabeth’s birthday party on Sunday and like I say…craziness! But, it’s a good craziness. Have you heard? Of course you have, this is the BLA! We have moved from one location to another in Nisswa. We are circling the wagons and are now located in the building right between Holiday gas station and the waterslide. We are actually on the east end of the water slide parking lot, perfect location. We also have a new satellite location over on the shores of Lake Mille Lacs! We are going to have a presence at the Garrison Creek Marina. The fishing over on the big lake is going to be incredible this year!! As for fishing, the crappie bite has been pretty darn good and the walleye forecast looks good too. The only thing that looks like it will get in the way is a cold front, temps are supposed to be near the freezing mark on Saturday morning! We are running there same guides as we have the past few years with veteran Bruce Meinz leading the charge. I’m doing more trips this year too and we are hoping to keep the rest of the crew hopping as well. The calendar is getting marked up and the phone has been ringing daily, call Shelley at 218-839-5598 if you would like to book! For now, I most get going. I hope all of you have an awesome opener and next time you see us at the shop make sure you swing in! Good morning from frigid Lake Shore, MN. At 20 degrees below zero I’m thinking I should be able to use the word frigid, don’t you think! Bottom line, we are making ice and that is a necessity for our area! The Brainerd Jaycees Extravaganza has been postponed until February 6th because of inconsistent ice depths. This most recent cold snap will certainly do wonders for the ice and people are driving full-sized trucks in many areas already. As for the fishing, it’s been o.k.. We are catching some walleye’s, pike and panfish in the Brainerd Area. We (the family) slept out in the new fish house this last weekend and had a good time with the Feltz’s and the Elsenpeter’s! Watched some football, caught some crappies and pike and got a few hours of sleep. I also had the Cisco Systems crew out, and their group consisted of many folks from out of the country! The tip-ups were going up fairly consistently and I believe all of the 13 had a crack at a pike or two! The house will soon be headed to walleye country and hopefully we can find a nice spot with some hungry fish. The SnoBear has been in action a lot as of late and this machine never ceases to amaze me (or others) as to it’s incredible technology and durability! The thing is an ice fishers dream and if you are interested in taking a trip, let us know! Good morning. And that it is, it’s absolutely gorgeous here in Lake Shore, MN this morning. It’s December 9th and we should be walking on Gull lake. Instead, I have had my Larson FX202T fishing boat out on the water the last couple of days. I’ve caught some walleye’s, but they weren’t really jumping in the boat while I was out there. Didn’t really bother me too much though, the peace and quiet is awesome all by itself! We are certainly not getting the jump on the ice fishing like we did last year, can you say extremes. That seems to be the way the world is rolling as of late! There are bays and some of the smaller lakes that are frozen, but I don’t feel too good about venturing out until next weekend. In fact, we are doing the January Mills Fleet Farm Walleyedan end cap from the boat, I do believe. So, for now it’s time to jump in the boat or get on stand! Or maybe go try to jump a grouse or rooster somewhere. Whatever the case, we are still booking guided SnoBear trips and eventually we will be out walking on ice. If you are looking for a gift idea for the sportsman or woman in your life, we have some pretty cool wooded gift certificates for either open water or ice fishing! Enjoy today, you never know what tomorrow will bring! p.s. The Sno Bear is ready! Hello! Not sure about you, but I have thought many times about those that were killed, injured or lost loved ones 13 years ago today in NY! And it sounds like we are going after the next group of radicals too, I would not want to be them! We sure are going through some interesting times. On a different note, it’s hunting and fishing season! Minnesota and Wisconsin archery season opens on Saturday and I plan on being involved in both of the states archery seasons this year. I will open up the Minnesota season with my son Mac and then head over to the neighbors (WI) and crack one down with my new Excalibur crossbow. I will certainly keep you posted on what shakes down there (and here). The fishing is going to get good, REALLY soon! I had a good trip last Friday with Dave Copham, Rick and Mick. We fished Gull and caught 11 walleye’s for the pan. The next day I was on Mille Lacs with Brian and Ray Dewitt and we were after musky. We ended up with two follows and saw another. Later that afternoon my wife and son joined me for some nice smallmouth bass action, we caught some big ones! There is so much to talk about, I don’t know where to quit. I am excited to pick up my new SnoBear and also excited to order my new Larson FX fishing boat. The SnoBear is still for sale as of today but the 2014 Larson FX 2020 DC has been sold to E.B.! 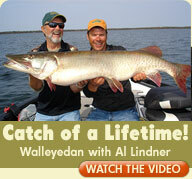 And how can I forget, it’s almost time for our 2nd annual Walleyedan’s Fishing To End Hunger walleye tournament. The big day is October 4th and it’s headquartered at Bar Harbor on the Gull Lake Chain. This is a charity event and the beneficiary is Kids Against Hunger Brainerd Lakes Area. For more information, go to www.fishingtoendhunger.com! Sign up today, spaces are becoming limited! !